rocky's bru: Who in PAC leaked confidental info to WSJ? And who the hell is Kamal Siddiqi? Who in PAC leaked confidental info to WSJ? And who the hell is Kamal Siddiqi? We refer to a biased article by the Wall Street Journal today relating to US$1.4 billion of payments made by 1MDB. We note that the Wall Street Journal does not name its source or provide any proof of the unproven allegations it is making, thereby seriously discrediting its sensationalist story. 1MDB cannot speak on behalf of Aabar or IPIC nor can we comment on the accounting arrangements of third parties. What we can confirm is that the 1MDB audited financial statements clearly describe the amount and purpose of the payments, which for the avoidance of doubt, is structured as a deposit (i.e. a financial asset belonging to 1MDB and not an expense to 1MDB). Secondly, based on those payments, we can confirm that IPIC did provide and continues to provide, guarantees for the principal and interest of 2 x US$1.75 billion bonds issued by 1MDB, with a total principal and interest amount of approximately US$5.5 billion. Thirdly, we can confirm that 1MDB auditors, Deloitte, made specific and detailed enquiries on these payments prior to signing off on the 1MDB audited accounts. Fourthly, Deloitte has strongly defended its methodology and audit process of 1MDB at the Public Accounts Committee (PAC) hearings, a bipartisan select committee of the Malaysian Parliament. Accordingly, the Wall Street Journal is wrong to state “it isn’t clear what happened to the funds”, at least not from a 1MDB perspective. More importantly, we are shocked that a hitherto reputable publisher such as the Wall Street Journal would make use of clearly confidential information in its reporting. We refer specifically to the WSJ confirming it has reviewed a “transcript of the proceedings”, from a parliamentary committee probing 1MDB, of which the only possible source is the PAC hearings on 1MDB. The Standing Orders of the Malaysian Parliament very clearly states that “the evidence taken before any Select Committee and any documents presented to such Committee shall not be published by any member of such Committee, or by any other person, before the Committee has presented its Report to the House”. The actions by Wall Street Journal are a potential breach of Malaysian law by a supposedly respectable foreign publication. We are further concerned as to who involved in the PAC hearings may have leaked this transcript, which is clearly an attempt to prejudice the PAC investigations and deny 1MDB its right to due process as provided for by the laws of Malaysia. 1MDB strongly urges the relevant authorities to investigate this matter thoroughly and take all requisite action to preserve the process integrity and Standing Orders of the Malaysian Parliament. 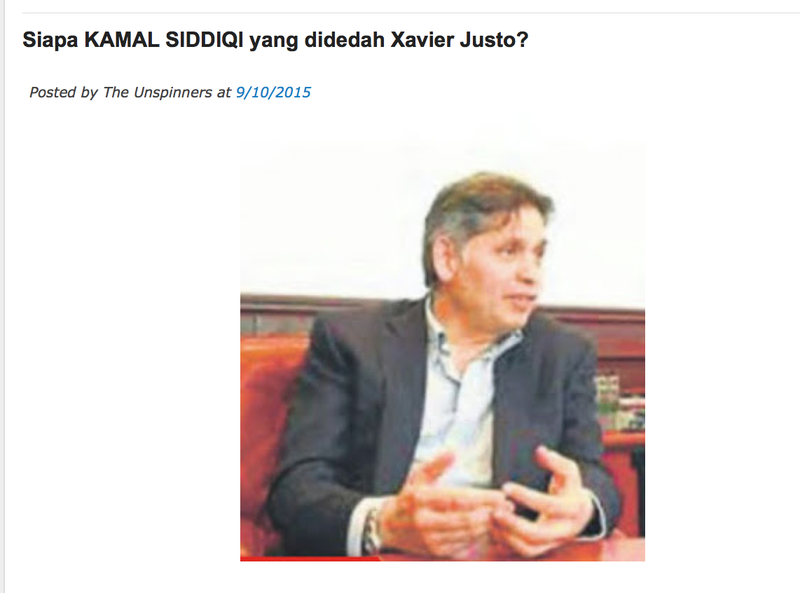 Who the hell is Kamal Siddiqi? Read the Malay Mail's exclusive H E R E.
Me, I heard it was Mr Kamal Siddiqi who arranged for the meeting between Tun Dr Mahathir Mohamad and Claire Brown and another between the former PM and Azmin Ali, the Selangor MB, in London recently. Wallahualam. All these shenanigans by 1MDB had caused the IPIC MD and Aabar CEO got sacked! More than meets the eye in this deal. Nothing surprising about Tun M meeting Clare. There is proof in a picture that both of them had met. Tun M met a lot of people. 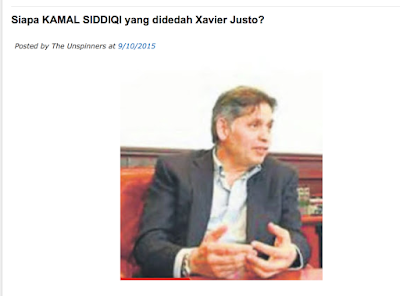 Najib met Saiful Bukhari before the sodomy2 went public. Important things is, where is the money? 2.6 billion lost and now 1.4 billion too? Where is the proof that he did not use it for personal gain? Can salleh keruak finally get his teeth sorted out before spraying people with more cover ups? We want to know the whole story. You are obsessed on who is leaking the story. Kinda like a murderer upset with the witness of the murder. If only there is no witness, none of this would happen. Senang saja ular dapat kontrak dgn company berkaitan dgn Madey. Dahlah kroni madey merata. Still very concerned about the "leakages" but not what inside it. Who ever leak this information must be very fade up with the on going "investigation" as to many "cover up" to protect the wrong doer(s). Why the hell AG who lead the task force been terminated and PAC members been promoted suddenly? Obviously responsible members in PAC who also responsible citizens have leaked the information, since their intention to reveal the wrongdoing denies . Therefore, other channel has to be used to nail the culprit. Let's find that dirty rotten whistleblower and put him in jail, shall we? Yupe, somehow, it is supposed to make sense that we concentrate on finding that whistleblower instead of finding out where that USD$1.4 billion has gone to!!!!!! As my Indon friend told me, "Melayu bodoh" - ni bukan saya cakap, ok? Ni orang Indon yg duduk di kampung Melayu yg cakap, ok? Jangan marah saya, ok? najis arul an imdb have lost CREDIBILITY. yang terkial kial nak tegakkan benang yg dah basah KUYUP. sneaking away from hard questions, running away from media, AWOL at #nothing2hide and the recent IACC openiing speech. excuse: hostile environment??? Berita x sahih atau Datuk hanya dengar cakap2 orang..rasanya tak payah tulis la kot Datuk.Takut nanti orang label Datuk macam Malaysiakini pulak. Who else....no name mention,he will be perceived as the one because we Malaysians like to be the citizen judges as the person that had been accused must prove to the world that he is innocent until such time the court do so.This what happened to Jibby. Kamal Siddiqi was last heard of in Malaysia in 2002 when his Frazer-Nash Group, a group specializing in electric vehicle technologies, signed an agreement with Malaysia Mining Corporation Berhad (MMC) “to design and build a monorail system”. Earlier, in 2000, Kamal Siddiqi signed an agreement with Perusahaan Otomobil Eletrik Malaysia (M) Sdn Bhd to produce over 1,000 unites of electric-powered vehicles. The agreement was signed in London in the presence of then Prime Minister Mahathir Mohamad. In 1998, Frazer-Nash supplied electric vehicles to the Commonwealth Games staged in Kuala Lumpur. Mahathir was then Prime Minister. In 2000, the company supplied the Sydney Olympic Games with the same type of vehicles. Tahun 2000 dia jumpa Mahathir. Bila tahun 1MDB ujud? Jahat betul orang tua ini. bru.. u used the word 'I heard', and end the sentence with wallahualam. fitnah lagi teruk dari membunuh bru. Rosmah dpt duit berjuta-juta hang tak condemn or highlight langsung, rakyat beban gst, duit berbeliyon hilang etc etc..
You are trying very hard to work around the technicalities. Unfortunately, all the technical thus far, led to the same conclusion. Gusto would have not been jailed for blackmailing if the document he was trying to sell were tampered with and not original. That Baslisyah guy would have lost his job if his technical analysis of the SWIFT was correct. Harimau Malaya would have not been trashed 10-0 by the UAE if someone did say earlier that it was the Arabs from the UAE who made the transfer of the donation and not a Saudi prince. But the more important questions are - where the USD1.4 billion gone to? Where the USD0.7 billion came from? Who's keeping (or rather enjoying!) the remaining USD0.7 billion? Allo Allo. ."worrier" tu apa? Getah sekerap ka? Dulu ambil English Lesson di London ka?